Ladies Recreational Football Taking Glasgow by Storm | LEAP Sports Scotland Taking a peek at Ladies Recreational Football for Scottish Women & Girls in Sport Week. "> Taking a peek at Ladies Recreational Football for Scottish Women & Girls in Sport Week. On the closing days of Scottish Women and Girls in Sport Week, we take a look at a new community football initiative which has managed to engage women of a variety of ages, abilities and backgrounds. 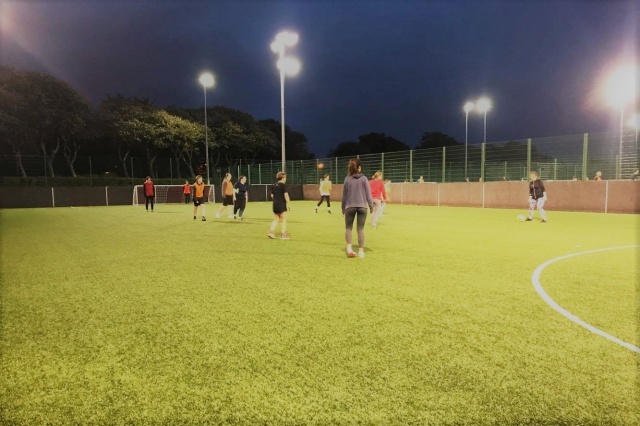 Since becoming part of LEAP’s network three months ago, Ladies Recreational Football (LaRF) has already managed to attract an average of sixteen players a week. Although this success can be attributed to a number of factors, the charisma and motivation of organiser Kirsten Sinclair has been an undeniable driving force. To learn a little more about the success factors behind the group, I joined them at one of their regular Tuesday night sessions at Glasgow Green Football Centre. Having been my first time at LaRF, it became immediately clear how welcoming and friendly each participant was. Joining a new sports group can be a daunting experience for many people, but the players at LaRF make you feel at home. In addition to mentioning how friendly everyone was, new recruit Katrina stated ‘I didn’t know any rules, but it really didn’t matter’. Kirsten is extremely proud that the initiative offers an easy access point to football. Research by sportscotland identified a strong focus on competition as a barrier to participation for many women, particularly those new to a sport. As I overheard the frustrated cries of the men playing on the next pitch, I couldn’t help but feel I was on the right side of the fence. Something which appears to work well for the initiative is that the LaRF model doesn’t put commitment pressure on participants. Women are free to show up as they please. This guilt free approach seems to work for Megan, who’s in the army and often travelling. Megan mentioned how she enjoys the freedom of being able to attend sessions when back in Glasgow. During our interview with Kirsten, she mentioned the importance of partner organisations. LEAP has been able to help Kirsten out with gauging interest and promoting the club. Long standing LEAP volunteer and regular LaRF participant, Denise first heard about the group during LEAP Sports Scotland’s Festival Fortnight. Beyond research and promotion, there are lots of different ways we can help you set up your own inclusive sports group. Please get in touch via info@leapsports.org or 01412020777. Should you feel that LaRF is the right fit for you, contact Kirsten at kirstensinclair@netscape.net or 07512785908. Otherwise you can simply show up at Glasgow Green Football Centre at 6.45pm any Tuesday. If you’d like to find out more about the initiative you can also like their Facebook page. Interested in the role of gender in football? Take a look at this blog. Written on 7th October 2017.